Newspaper clipping. 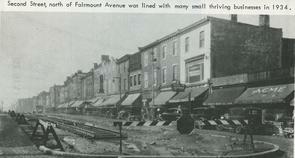 Caption: "Second Street, north of Fairmount Avenue was lined with many small thriving business in 1934". View of buildings and businesses along 2nd Street. Streetcar track construction in foreground.